The chaps overs at Phoronix have analyzed the performance of the Radeon HD 4850 under Linux. While the ATI Radeon HD 4800 series was greeted with same-day Linux support, this first-cut Linux support clearly isn’t as well optimized as the Windows driver. Alternatively, to this point they may have spent all of their resources tuning the DirectX performance and have forgone tuning the OpenGL side. 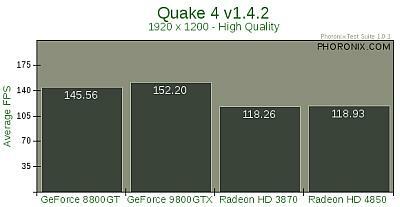 What’s the explanation for the Radeon HD 4850 on Linux falling so far behind their competitors? According to AMD engineers the Linux driver has yet to be well optimized.